During pregame warmup the starting pitcher will loosen up in the bullpen. Chris Young of the San Diego Padres warms up in the bullpen at Wrigley Field prior to a game. This is an example of a bullpen that is located in foul territory on the playing field. Each team generally has its own bullpen consisting of two pitching rubbers and plates at regulation distance from each other. In most Major League Baseball parks, the bullpens are situated out-of-play behind the outfield fence. There are currently four MLB parks with bullpens in playable foul territory: Wrigley Field, AT&T Park, Oakland Coliseum and Tropicana Field. The origin of the term bullpen, as used in baseball, is debated, with no one theory holding unanimous, or even substantial, sway. The term first appeared in wide use shortly after the turn of the 20th century and has been used since in roughly its present meaning. According to the Oxford English Dictionary the earliest recorded use of "bullpen" in baseball is in a 1924 Chicago Tribune article from October 5. The earliest known usage of the term "bull pen" relating to an area of a baseball field is in a New York Times article from June 24, 1883. The earliest known relief pitching related usage of "bullpen" in the New York Times is in an article dated September 18, 1912. 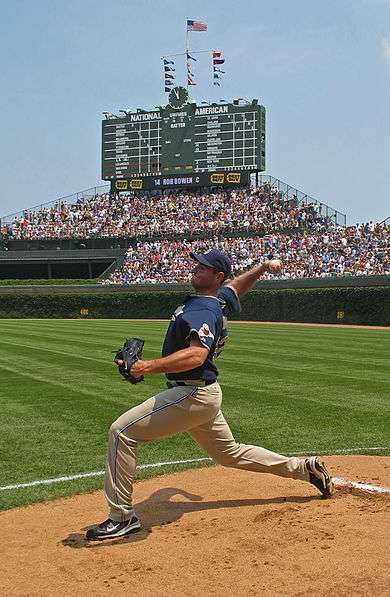 Four major league stadiums current have their bullpens in foul territory: Wrigley Field (Chicago Cubs), O.co Coliseum (Oakland Athletics), AT&T Park (San Francisco Giants), Tropicana Field (Tampa Bay Rays). This was more common in the past and most new stadiums have opted to move the bullpens to the outfield where the ongoing play is less likely to interfere with the bullpen. In parks with foul-territory bullpens, the relief pitchers and bullpen staff generally sit in chairs or benches along the wall between the field and the stands. The bullpen pitching area is in foul territory and in some of the stadiums, is right up against the foul line. 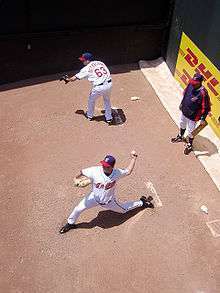 It is therefore not uncommon for batted balls to head towards the bullpen requiring pitchers warming up (and even those sitting along the wall) to move to avoid interfering with a live play or being hit by the ball. There is commonly a ballboy at the end of the bullpen nearest to home plate to attempt to protect the players from foul balls hit in that direction. Between 1951 and 1995, varying numbers of MLB teams used vehicles to transport pitchers from the bullpen to the mound. These vehicles ranged from golf carts to full-sized cars. The 1951 Chicago White Sox were the first to use a bullpen cart. The last use of a bullpen vehicle was a motorcycle and sidecar used by the 1995 Milwaukee Brewers. Reference to a large open work area consisting of desks with no separating walls and private offices. Bullpens were common across many business fields in the first half of the 20th century and are often used by software development teams. Michael Bloomberg used this set-up and term at his media company Bloomberg L.P., and for his staff while Mayor of New York City. Adrian Fenty used this setup also while mayor of Washington, D.C..
Wikimedia Commons has media related to Bullpen. ↑ "Etymologies & Word Origins: Letter B". Wordorigins. Archived from the original on 2006-04-28. ↑ "THE BASE-BALL SEASON" (PDF). The New York Times. June 24, 1883. – (New York Times reporting on the Providence/New York game of June 23, 1883) "Denny drove the ball into the bull pen in the sixth inning, and would have secured a home run without the ball going outside the fence had he not stepped directly over instead of upon the bag at third base, the umpire giving him out." – retrieved March 10, 2010 – The term here refers to an area of the field that was in-play. Unstated are the specific purpose of the bullpen and whether the area was in fair or foul territory. ↑ Kleiner, Carolyn. "The Demon of Andersonville" Retrieved March 19, 2007. ↑ Commission on Wartime Relocation and Internment of Civilians. Personal Justice Denied "Chapter 9: Protest and Disaffection" Archived September 29, 2012, at the Wayback Machine.. Washington, D.C., December 1982. Retrieved March 19, 2007. ↑ Jim Kershner, Carl Maxey: a fighting life, V Ethel Willis White Books, 2008, page 25. ↑ Emma Langdon, The Cripple Creek strike: a history of industrial wars in Colorado, 1903-4-5, Great Western Pub. Co., 1905, page 468. ↑ Haywood, William D. The Autobiography of Big Bill Haywood, 1929, page 81. ↑ Heckle Depot. " Archived July 11, 2011, at the Wayback Machine. Retrieved July 2, 2010. ↑ Dey & Associates Office Planning Manual Archived May 30, 2008, at the Wayback Machine. ↑ Umminger, April; Lindeman, Todd (February 20, 2007). "Inside Fenty's Bullpen". The Washington Post.